Salon and Spa Galleria has remained steadfast in offering the best of executive and luxury salon premises renting and leasing services to our esteemed customers. 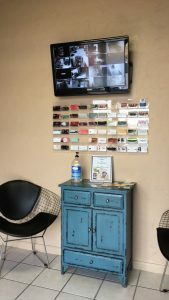 Salon and Spa Galleria was not just established by people who were interested in the business aspect but knowledgeable professionals in the Salon Industry. We value your needs and work hard to ensure your complete 100 percent satisfaction. Suites type salons offer each stylist his or her own private suite, with four walls and a door. Within that suite is everything needed to run a small one or two person salon: A styling station and chair, shampoo bowl and chair, hair dryer, and other furnishings as available. Nail suites, skin care suites, and massage suites are, of course, furnished differently. This approach offers your clients privacy and one on one attention. Every luxury salon suite is fully appointed and can be personalized to suit your needs and the needs of your clients and offer pride in ownership that is priceless in the salon trade. With a luxury salon suite from Spa Galleria, your clients will receive the highest levels of service and support and will be greeted by a warm and welcoming staff as they relax in our modern, comfortable salons. Salon Suites differ from the traditional salon style in some very distinct and important ways. In traditional salons, stylists work at stations/booths that are either out in the open or are semi-private. Hair shampooing and rinsing is done at a central location where there are usually multiple shampoo stations. Your salon suite is your private space. Decorate it to match your personality, style, and brand. Salon owners, our tenants, have the ability to decorate and personalize their Suite to their own taste. They are able to serve their clients on their terms and provide the personalized service that their clients have come to not only appreciate but expect. When you lease from us not only are you your own boss, you make your own money, set your own hours, and can sell product right out of your own suite and increase your revenue by 15-20 percent. We are dedicated to providing an inviting and comfortable atmosphere for you and your clients to enjoy. Our suites are designed for Independent salon professionals that desire the freedom of salon ownership. There are many benefits to leasing here with us at Spa Galleria such as: Setting your own hours and pricing schedules, 24/7 Access to your Suite, State-of-the-art Security System and Surveillance System, Complimentary Wi-fi, Website listing and link to your website, Ability to personalize and brand your suite as your own, Full-time Onsite Management. We want to make sure that when you rent from us all you have to worry about is your suite and taking care of your clients and being successful. If you are ready to get out on your own and start your own small business like you have always wanted then give us a call today. Come in and tour any location and see which one best fits you and all of your needs.